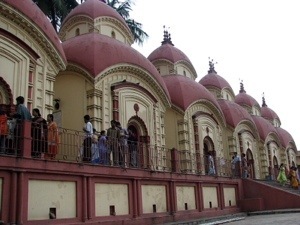 Twelve identical Shiva temples are established at the Dakshineswar Kali Temple in Kolkata, West Bengal. These twelve temples on the banks of the River Hooghly. Each temple has a Shiva linga made of black stone. Each of the twelve temples represents a Jyotirlinga. The temples were built in 1855 by Rani Rasmani. Sri Ramkrishna is said to have meditated here to reach enlightenment.